It's not a complete accident that we took that sunset cruise. But it took a lot of fortuitous coincidences to bring not about. 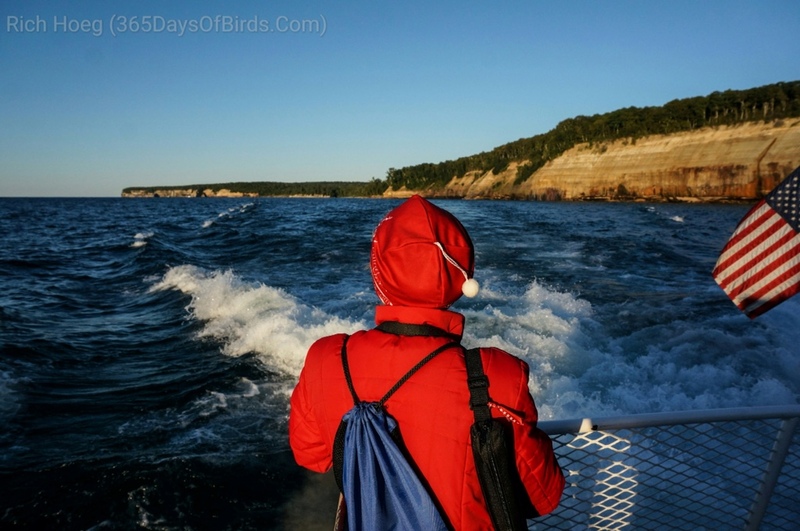 Returning to Crisp Point Lighthouse for our second stint as volunteer keepers, I knew we'd pass Pictured Rocks National Lakeshore en route. I was eager to see the shoreline from the water, but our extra day for exploring had been sacrificed to other commitments at home. 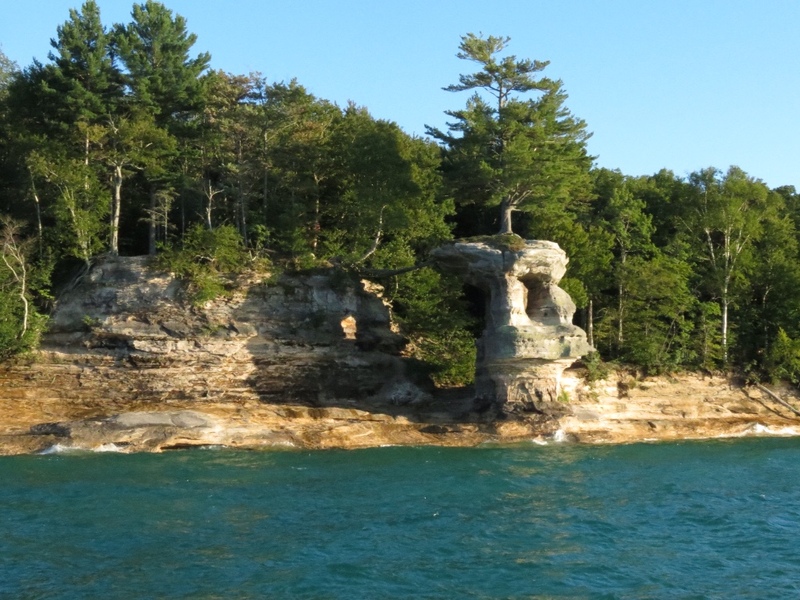 Our son, Erik, had just returned from a backpacking and kayaking trip on the area, and his fresh enthusiasm and praise for the scenery unwittingly planted a seed. 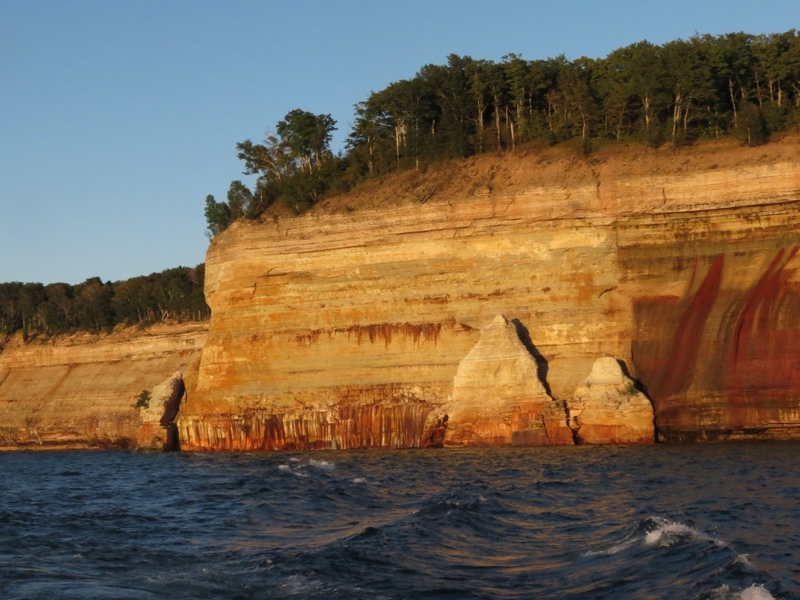 With only 30 miles remaining to reach Munising, I gave in to a nascent idea. 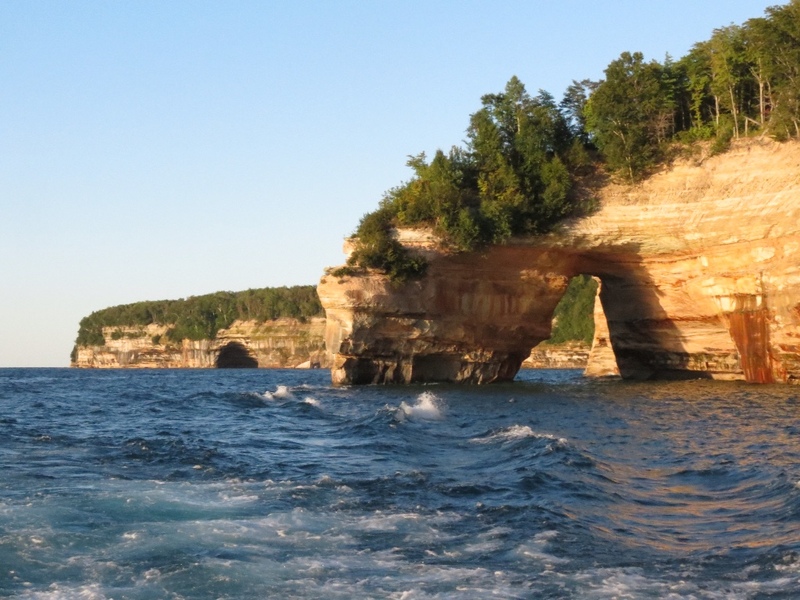 The weather was so perfect, might there still be a way to see Pictured Rocks after all? Eeking out a cell signal I managed to discover a sunset cruise and confirm that seats were still available. We would arrive in town with barely 40 minutes to spare, but it could work. I wasn't sure Rich shared my enthusiasm enough to jettison our plans for a relaxed salmon dinner in our kitchenette unit. But the photographer in him couldn't resist the late golden glow on a natural landscape. The race was on. We checked into our motel, dumped our gear and donned warm clothes in record time. We even had enough minutes to spare for Rich to grab a sandwich en route to the dock. As we stepped up to the end of the long line of waiting passengers the boat's doors opened and boarding began. But we still had one final hurdle to clear. Our captain's first words were a warning. The day's windy conditions had generated 3-4 foot waves and the father out we went the more uncomfortable it would get. Rich looked at me for an answer, as I readily sicken in big swells. However this was my brilliant idea and I wasn't about to give up on it. I declined the offer of a full refund and with that we departed. Although I could feel the growing swells and the edges of a familiar queasy sensation, stationing ourselves outside where I could stand and watch the shoreline helped me ignore the pitching of the boat. I was determined to make this work, but really it was Mother Nature who came to my rescue as the winds subsided and we had only rough chop for the remainder of the voyage. My system instantly sensed the change and I rejoiced in knowing I could enjoy the scenery and even take a few photos. The rear deck turned out to the the ideal spot for viewing. Protected from the wind we staked out a front row position along the railing. It was chilly enough for me to be glad I had brought a hat and gloves and was not too vain to wear them. The outdoor air was refreshing and we could still hear the captain's spiel. Sprinkled with dry humor, he kept us informed as well as entertained with just enough commentary to educate us on what we were seeing. The scenery did not dissapoint, from the dramatic colors to the uniquely shaped rocks. 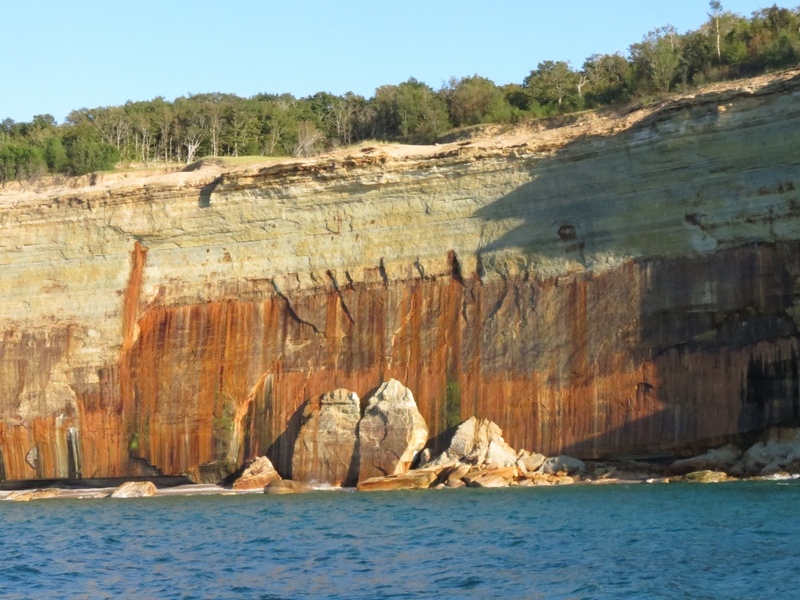 I was surprised to learn that it was the minerals leaching out of the rocks that “painted” them, as opposed to differing colors in the strata of the earth. That explained why the stripes were vertical not horizontal as I'd expected. Cruising was all the sweeter for its opportune nature. Evening if we'd planned it, we could never have counted on the perfect evening sunlight. And with each passing moment on our return trip the light became more golden. Those were the best views of all. Sometimes things just work out for the best. 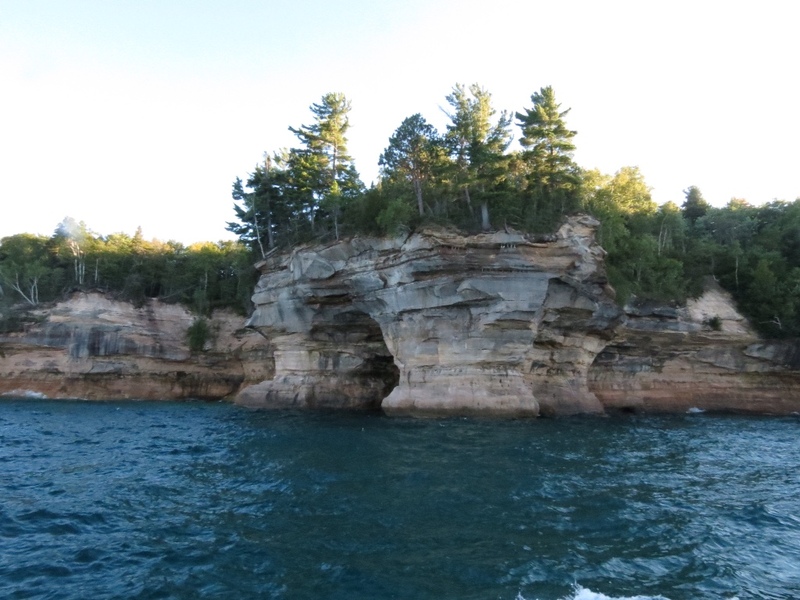 I not only got to see Pictured Rocks and in ththe finest light. That cruise was the perfect opportunity. 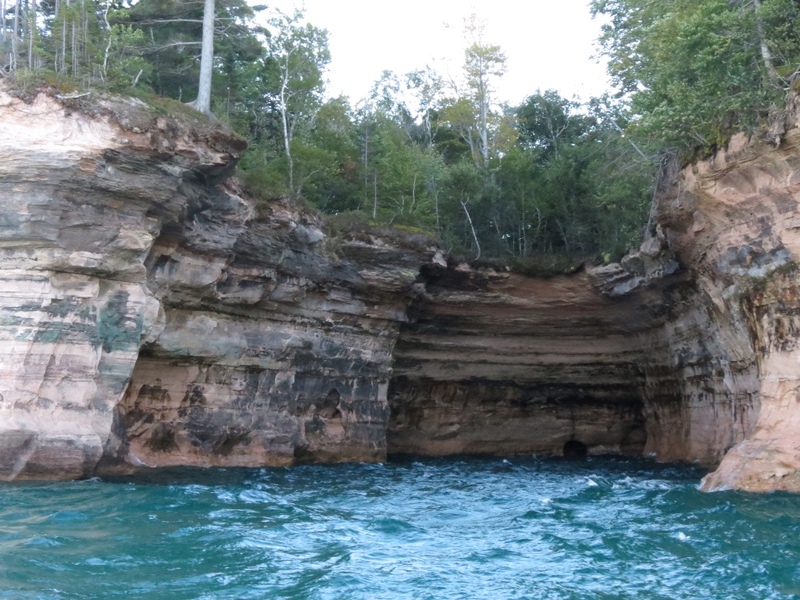 This entry was posted in Travel and tagged Lake Superior, Travel, Upper Peninsula by Molly. Bookmark the permalink. 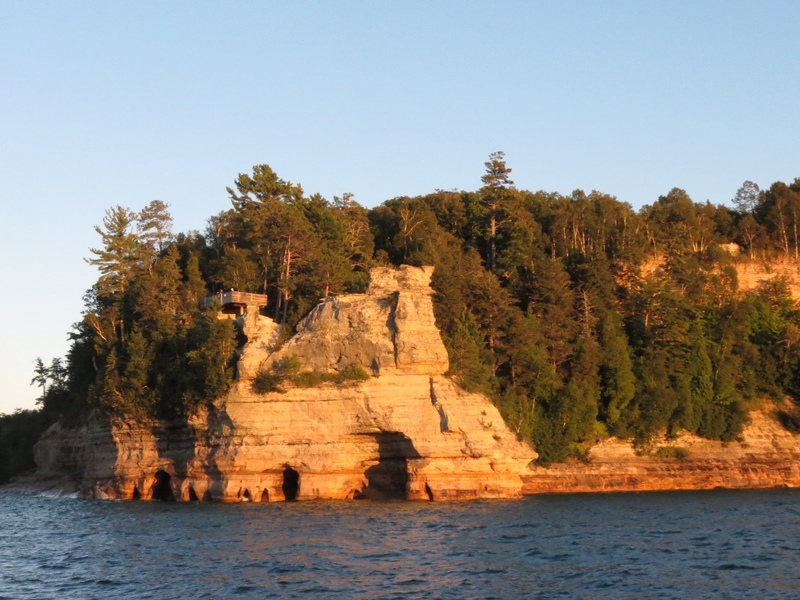 We love the Keeweenaw Peninsula in the UP – especially going up the western shoreline up to Copper Harbor. And of course Crisp Point Lighthouse – remote but beautiful!